Russia has a long legacy of suppressing freedom movements in Ukraine, the most recent of which is the annexation of Crimea and subsequent ongoing invasion of Donbas, which happened following the victory of the Euromadian revolution that resulted in the ousting of pro-Russian president Viktor Yanukovych. Ukraine’s history in the 20th century is a showcase of such examples. One of the most prominent ones is the story of Holodomor, or Ukrainian Famine, perpetrated by Stalin as a consequence of mass peasant uprisings in Ukraine against enforced collectivization. 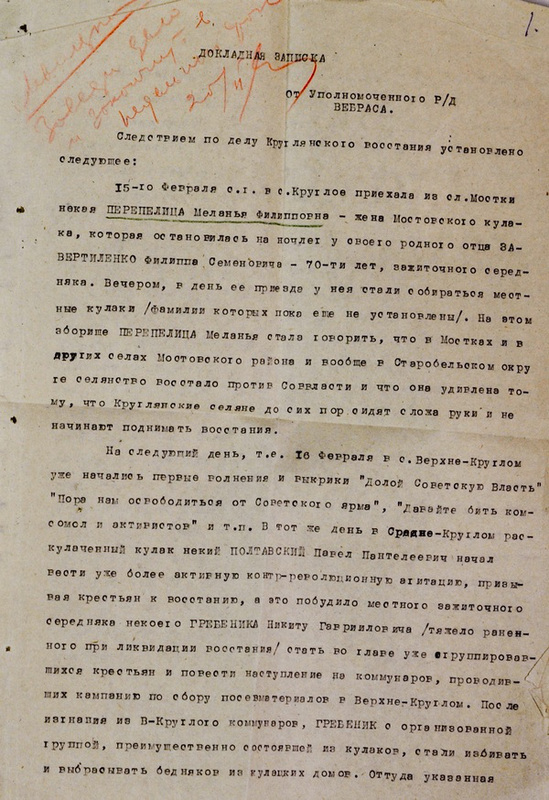 The Kremlin’s official pretext was to eliminate private land owners, the perceived enemies of the state – called “kurkuls” in Ukrainian/ “kulaks” in Russian. Holodomor radically crushed the ability of Ukrainian peasants to rebel against Stalin’s oppression and resulted in the starvation of up to 10 million people. This post features newly released photographs of the peasant uprisings that led to Stalin’s genocidal famine from from the archives of the SBU /Ukraine Security Service. Many photos were taken by the Soviet Cheka, or secret police. “Iron fist” enthusiasts, who nostalgically yearn for the Stalinist order, embrace Soviet agitprop’s rosy portrayal of social life. But in truth, at the start of the 1930s, the totalitarian empire was poised before a grave threat. Ukraine had disrupted Stalin’s ambitious plans. Today, wielding pavement stones and “Molotov cocktails,” Ukrainians ruined Putin’s strategy to resurrect the Russian empire. Back in Soviet times, armed with sticks and homemade handguns, Ukrainian peasants threatened the success of Stalin’s imperialist plans. Stalin provoked large-scale chaos and an explosion of violence in Ukraine. But before the communist regime was able to subdue the people, this country of the Kozaks erupted in an uprising. The Bolsheviks responded to the Ukrainian village uprisings with punitive actions, grandiose in scale and cynicism. Ukraine, the breadbasket of Europe, played a unique role in Stalin’s plans for modernization, and it was clear at that time, much like today, that the success of the entire neo-imperialist project depended on Ukraine. But it was precisely in this republic, pivotal to the USSR, that “something didn’t quite go as planned” after the start of enforced collectivization. What happened in the Ukrainian villages did not just call into question the success of collectivization, but it caused a rapid decline in the legitimacy of government authority. The stakes were extremely high in this game and led to an unbelievably savage finale. The systematic collectivization of land, de-kulakization, and the closure of churches were met by the largest and most sustained peasant riots ever seen in Ukraine, beginning after the 20th of February. Anti-kolhosp protests and anti-Soviet uprisings gathered especial momentum in Eastern Volyn and Podillia, where the insurgent peasants succeeded in gaining control of several regional (raion) centres. The anti-soviet peasant insurgency took over the Liubarskyi and Yanushpilskyi raions of the neighbouring Berdychivsk area. Fifteen hundred villagers captured Liubar, forcing the police units out of the raion centre. By mid-March, peasant uprisings and armed riots had overwhelmed 16 raions in the border zone. New administrators were elected in those villages liberated from soviet control. In the raions of Bershadskyi, Dzhlunskyi, Olhopilskyi, and Obodivskyi of the Tulchynskyi rasion, the peasants rallied around slogans for independence, and sang the national anthem. Several thousand peasants marched on the raion centre of Sharhorod (Mohylivska rasion) to bring the communists and local Soviet agitators to justice (6). The majority of the kolhosps were liquidated. The uprising was gradually taking over the East, advancing towards the Soviet capital of Kharkiv. The uprising in the Sumskyi raion was especially fierce. The massive peasant demonstrations offered armed resistance in several villages of the Ternivskyi raion. Full blown battles with police units occurred in the villages of Dmytrivka and Sukhoverkhivka and the settlement of Suprunivka. One peasant insurgent unit, numbering 20 people, armed with primitive handguns and hunting rifles, operated in Romenschyna throughout the month of March. 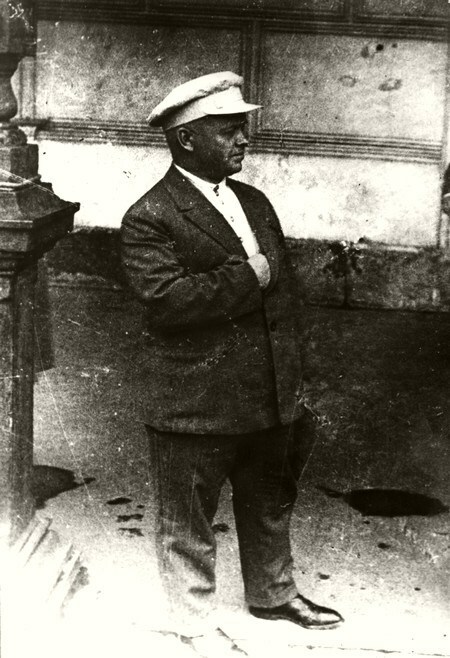 This unit was associated with the peasant insurgent organization of Otaman Luka Klitka, rallying the Romenska and Prylutska regions around the call for the re-establishment of the Ukrainian National Republic (UNR). Armed clashes against the government DPU units continued until the end of July. The peak of the riots and armed uprisings occurred in March, 1930. In March, 1930, throughout Ukraine there were 2945 mass peasant demonstrations, or 45% of the total uprisings (6528) throughout the Soviet Union. This was at a time when the Ukrainian Socialist Soviet Republic (USRR) accounted for only one fifth (20%) of the total population of the USSR. After such losses, a repetition of what happened in early 1930 seemed impossible. The Bolshevik leadership made the most of the temporary stifling of the protest movement in Ukraine. 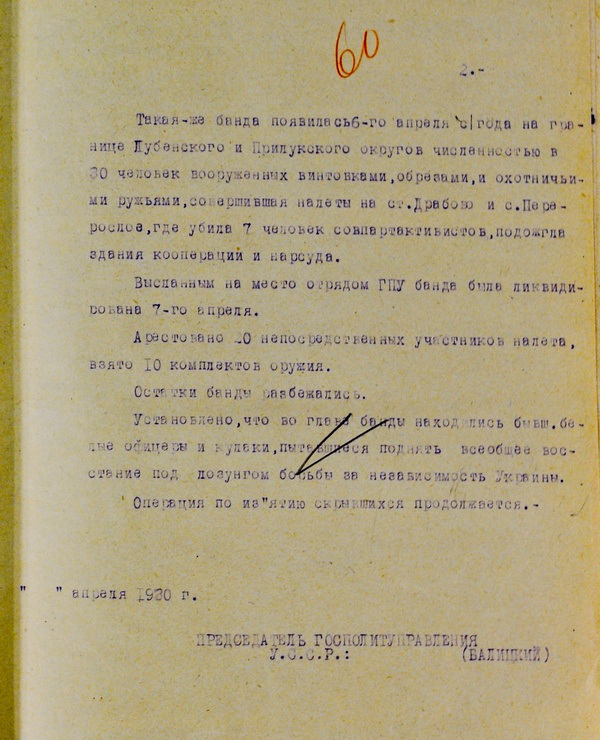 Lessons were learned from the unsuccessful attempts at collectivization in the first months of 1930.The new approach imposed a burden of heavy taxes solely on private farmers, while offering subsidies to those remaining in the kolhosps. The majority of Ukrainian peasants took part in the game imposed by Stalin, and they begin to return to the collective farm system. Bearing in mind the failed massive uprisings, the most ardent insurgents engaged in new tactics of armed battle, forming small, isolated units of diversionary saboteurs – so called ‘kurkul gangs’. Yet, collectivization proved itself to be not a socialist zone, free from repression – but became rather Stalinist work camps. Savage retribution awaited all who fell into the trap and refused to follow the Bolshevik rules. By the spring of 1932, when the famine began in the collectivized villages, any hopes the peasants ever entertained that they would be safe from food confiscation or taxation terrors were completely dashed. The Ukrainian village stood on the brink of a new tempest. A second mass exodus from the collective farms would topple Stalin’s grandiose plans. The Soviet leadership understood that massive deportations were not effective. 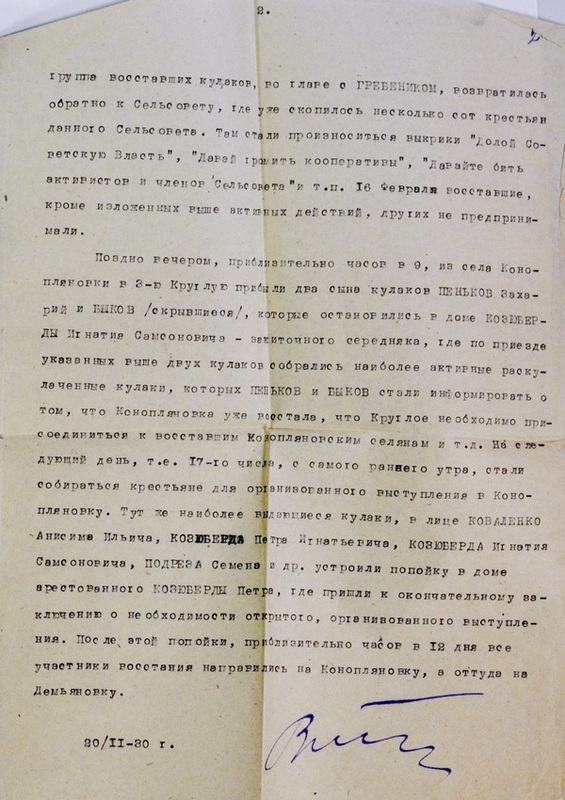 Fearing “the loss of Ukraine”, Stalin decided to deal with the insurgents at their source, especially since the mechanisms for massive executions had been well established in the 1920s. Rather than deport large groups of the population to far-off locations, the Bolsheviks decided to turn the entire territory of the Ukrainian SSR into one massive stockade. Commissioner of the Arbuzynsk RPK, Gyekov and his brigade during grain procurement in the village of Novo-Krasne (today – Mykolayivskyj Region). November/December 1932. 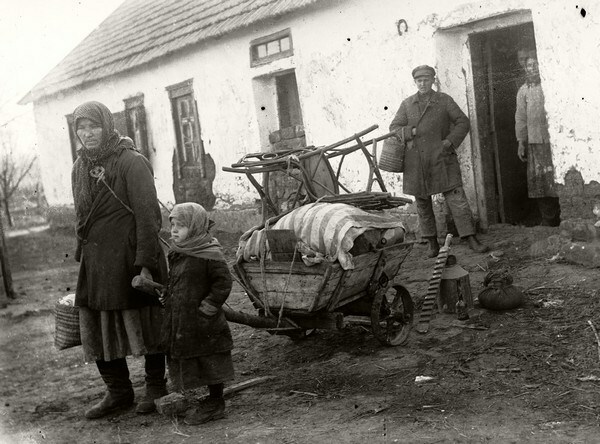 The hopelessness of any compromise with imperialism is shown by the millions of Ukrainians peasants destroyed by famine, many of whom had even been subservient to the government and were already living within the system of collectivization. Although in the 1930s millions of Ukrainian victims paid with their lives in a failed attempt to halt the advancement of the Stalinist totalitarian empire, they did succeed in preventing its final establishment: internal opposition by the people halted its foreign expansion. The greatest Ukrainian tragedy of the twentieth century must warn us against any illusions regarding the Empire’s next moves.. The empire is vindictive, and will never forgive involvement in any type of “Maidans”; it will ruthlessly retaliate even against those who merely sympathized. It is merciless to those who claim to be neutral, who stood and watched from the sidelines. ЦДАГОУ. – Ф. 1. – Оп. 20. – Спр. 3191. – Арк. 37. ДАХО. – Ф. П-458. – Оп. 1. – Спр. 326. – Арк. 8. ЦДАГОУ. – Ф. 1. – Оп. 20. – Спр. 3184. – Арк. 95. ЦДАГОУ. – Ф. 1. – Оп. 20. – Спр. 3191. – Арк. 41. ЦДАГОУ. – Ф. 1. – Оп. 20. – Спр. 3154. – Арк. 11. ЦДАГОУ. – Ф. 1. – Оп. 20. – Спр. 3184. – Арк. 62, 64. Васильєв В. Перша хвиля суцільної колективізації і українське селянство / В. Васильєв // Васильєв В., Віола Л. Колективізація і селянський опір на Україні (листопад 1919 – березень 1930 рр.). – Вінниця, 1997. – С. 233. ЦДАГОУ. – Ф. 1. – Оп. 20. – Спр. 3154. – Арк. 30–31. Даниленко В.М. Антирадянське повстання селян в Україні напередодні голодомору / В.М. 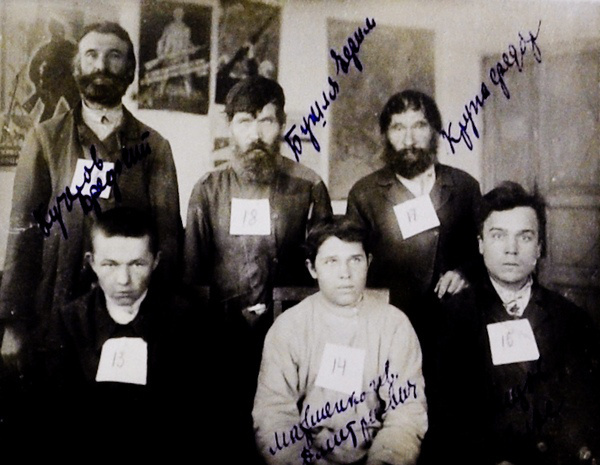 Даниленко // Павлоградське повстання 1930 р.: Документи і матеріали / Упоряд. В. М. Даниленко. – К., 2009. – С. 13–27. Трагедия советской деревни. Коллективизация и раскулачивание. Документы и материалы. 1927 – 1939: в 5 т. – М., 2000. – Т. 2. – С. 791. ЦДАГОУ. – Ф. 1. – Оп. 20. – Спр. 3153. – Арк. 72. Советская деревня глазами ВЧК–ОГПУ–НКВД. 1918 – 1939. Документы и материалы: в 4 т. – М., 2003. – Т. 3. – Кн. 1. – С. 546 – С. 533. ЦДАГОУ. – Ф. 1. – Оп. 20. – Спр. 6390. – Арк. 135. Трагедия советской деревни. Коллективизация и раскулачивание. Документы и материалы. 1927 – 1939: в 5 т. – М., 2001. – Т. 3. – С. 350. ГДА СБУ. – Ф. 16. – Оп. 27 (1951 р.). – Спр. 4. – Арк. 8. Советская деревня глазами ВЧК–ОГПУ–НКВД. 1918 – 1939. Документы и материалы: в 4 т. – М., 2003. – Т. 3. – Кн. 1. – С. 708, 710, 711. Советская деревня глазами ВЧК–ОГПУ–НКВД. 1918 – 1939. Документы и материалы: в 4 т. – М., 2005. – Т. 3. – Кн. 2. – С. 109. Трагедия советской деревни. Коллективизация и раскулачивание. Документы и материалы. 1927 – 1939: в 5 т. – М., 2001. – Т. 3. – С. 441. 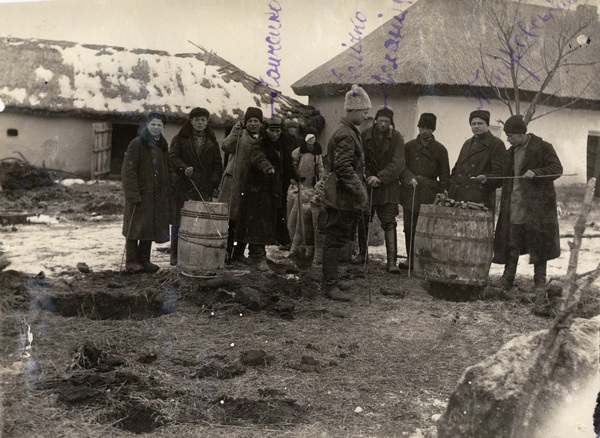 Informers, Moonshine, and Disdain for Property: How the Holodomor changed the way of life in the village.